The patrons and the devotees of the Hindu Temple were left in tears at this blatant hate attack on their Temple which is attended by some 300 devotees on an average. Reopening ceremonies of Bhartiye Mandir are open to everyone. 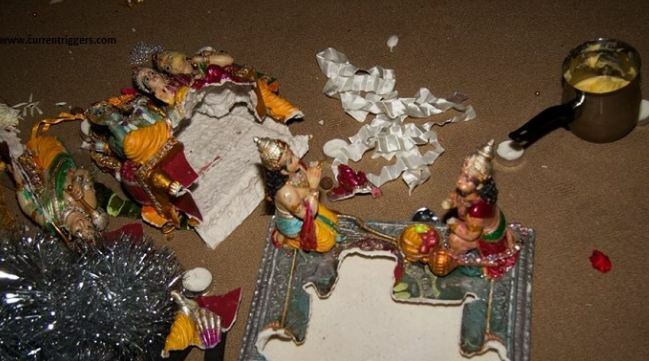 This vandalism resulted in destruction of sacred statues and images of deities, fire damage to the interior and carpet, prayer materials thrown around, broken instruments, various other items smashed/overturned and covered with paint, etc. ; causing damage of about $50,000 to this house of worship and sending the Hindu community in a state of anguish. Hindu statesman Rajan Zed, in a statement in Nevada (USA) yesterday, said that it was shocking for the worldwide Hindus to observe the hard-working, harmonious and peaceful Australian Hindu community receiving such signals of hatred and intimidation. Australian Hindus had made lot of contributions to the nation and society and continued to do so; Zed, who is President of Universal Society of Hinduism, noted. The foreigner Padma Shri Gausevak who left her home to tend to desi cows in India!